Some time ago, I mentioned in this blog a projector so small it can fit right in your shirt pocket. Well, only months later, this new projector technology has entered another major development phase, and can now be a mobile phone feature! 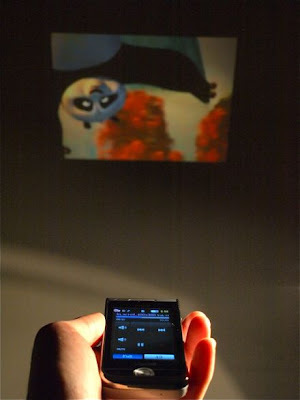 The Samsung Samsung W7900, aka The Show, is a fully-functional mobile phone with a built-in projector using the Texas Instruments DLP technology. From its analog days of simply enabling you to make calls, the mobile phone has evolved rapidly into providing digital content. With more phones supporting video and images, the projector capability is a logical step, enabling people to share the viewing of media in a more convenient and involved way. Learn more about this fantastic device at Popular Science (also photo credit to this site).